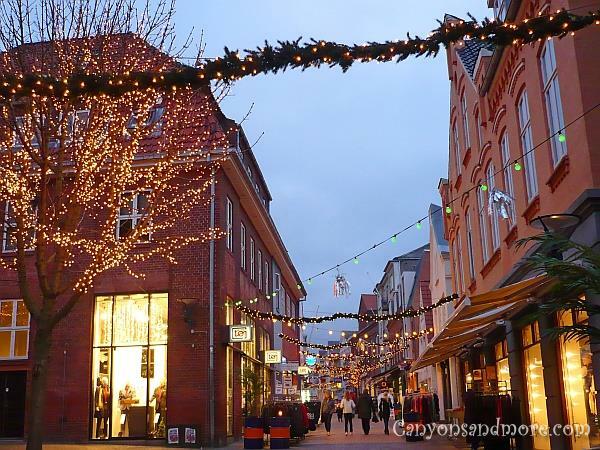 It is especially romantic to take a stroll down the main shopping street in the evening hours. 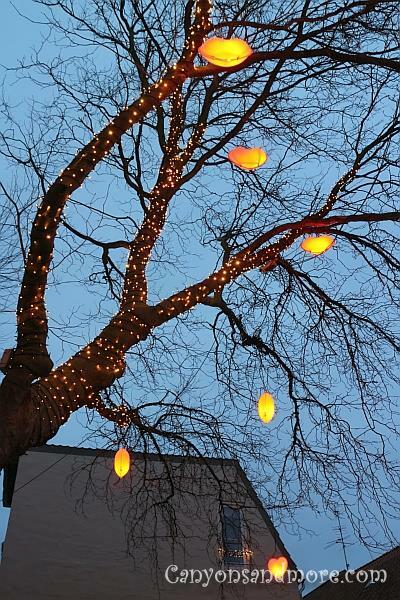 Garlands of evergreen and white lights decorate the street and trees are festively twinkling. The center of town is not large so you will see everything within a short time. Each year seems to have some sort of theme. One year Chinese lanterns were hanging from the garlands. Another there were American flags waving. 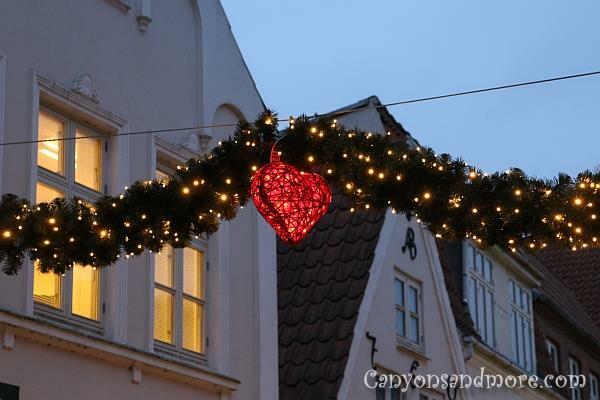 In 2011 there were red hearts adorning the garlands. 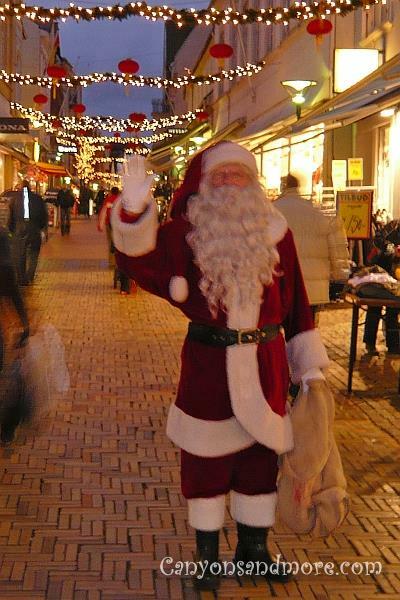 Each of the shops is lovingly decorated for Christmas in the colors of red and white. Red and white are the colors of the season and the motifs are cute and delightful. 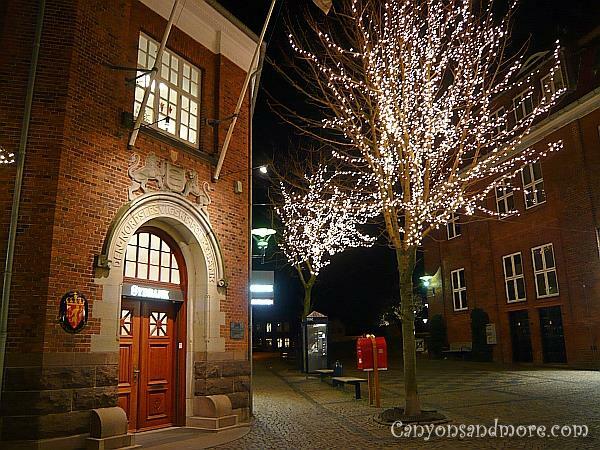 The image above shoes the main shopping street of Aabenraa, which is located in the south of Denmark, not too far from the German-Danish border . It is a coastal town on the Baltic Sea. Because of its northern location, the evening usually arrives fast in the winter and around 4 p.m. it is already dusk. Friendly wave from the Julemand. He was passing out candy to all of the children while we were there. How pretty it looks just outside the entrance to this bank. 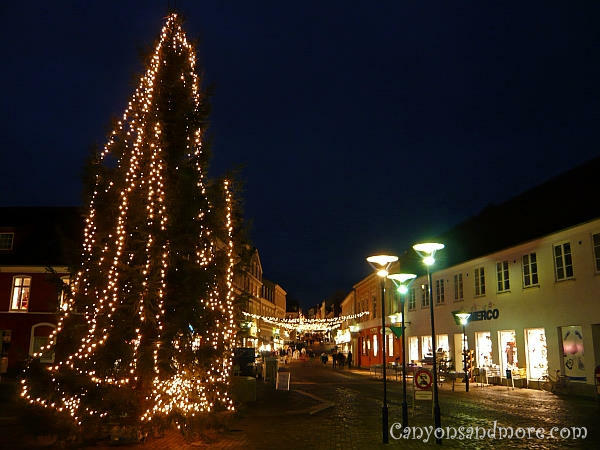 Trees illuminated with white lights give the town a warm feeling in the cold evening hours. During 2011 the town square was set up with small sized buildings to represent a mini town. This was just perfect for children and each building had workshops inside for crafting and baking activities for the kids. 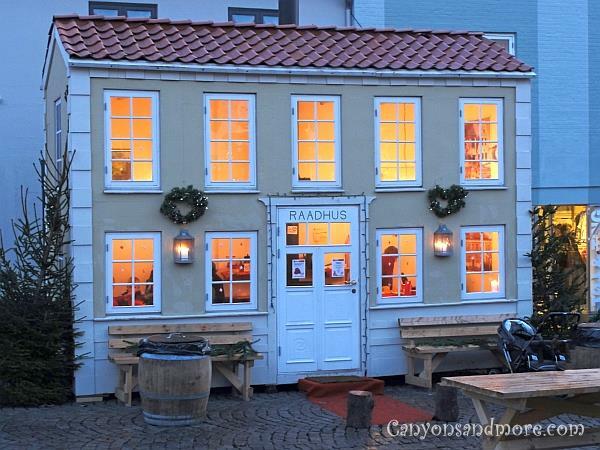 The miniature “Raadhus” or town hall. Inside was decorated so dainty and festive. What child would not want to spend the free time during the holidays in such a fun place? 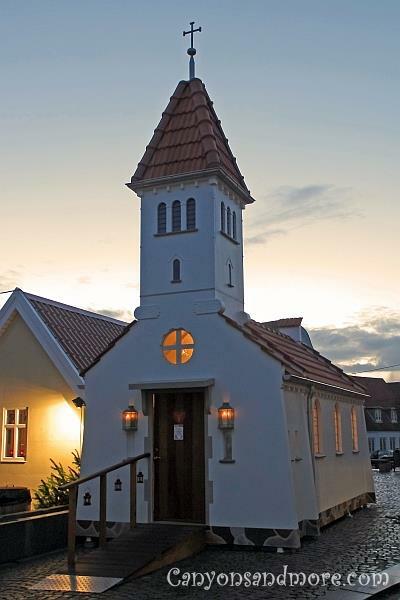 Included in this miniature town was a miniature church. The entrance is just the right height for a child to pass through. 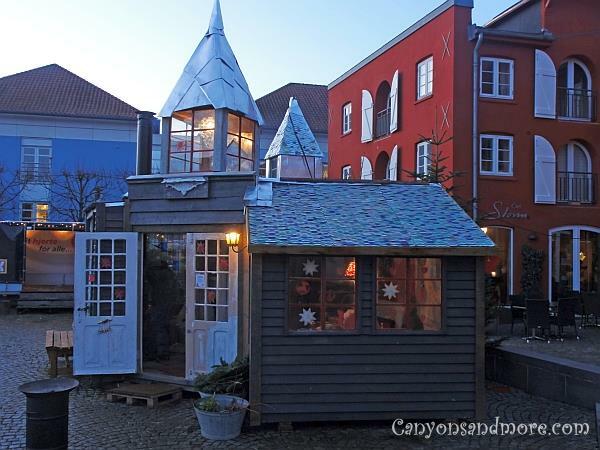 This was a minuature building for the kids to create paper crafts for the holidays. 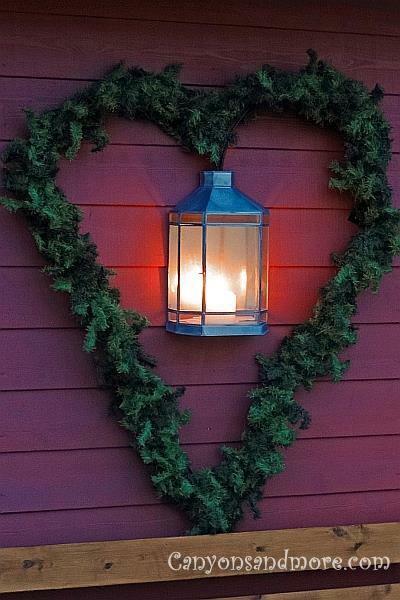 This lantern encompassed by a heart evergreen wreath just seemed to add a idyllic Christmas touch to the side of this building. A festively lit tree. This one adorns the town square and is quite huge in size. ... as well as to the garlands hanging over the street.